You know how sometimes you learn about the customs of another culture and you think, “Wow, that’s sort of weird and random. Why would they do that?” I was kind of expecting that reaction to various things in India (and I’ve definitely experienced it), but what I wasn’t expecting was exactly the opposite of that to happen as well. Sometimes, as I try to describe the customs of the holidays I have celebrated growing up to people I meet in India, I feel like David Sedaris must have felt that part of his book Me Talk Pretty One Day: he is in a French class in Paris, trying desperately to describe Easter in broken French. I wish I could remember the actual lines now, but he starts saying things like, “So Easter is when there is this man who dies because he is nailed to a board.” And then someone else interrupts, “No, Easter is when there are bunnies and flowers and eggs.” And you can just imagine the people in the class who don’t know what Easter is being utterly confused as to why someone would celebrate such a holiday. It’s only in the context of another culture that I’ve started to see how equally odd my customs must seem to people who don’t celebrate these holidays. And I laugh at these customs here in a way I never would have in the States. Sure, through years of repetition, customs take on meaning and create a tradition, but I think it’s twice as fun to celebrate when I can also share the amusement at their surface oddity with the culture around me. Halloween is a completely foreign concept to most Indians. Dressing up as witches and ghosts? Carving pumpkins with scary faces? Going to people’s doors and threatening them into providing candy? Seriously? My roommates and I decided to throw a Halloween party, and while we managed to find a store in Khan Market (a very western market in Delhi) which had a few large stretchy spiderwebs made from black wool, some paper pumpkins, and the bare-bones costume options of pirate hat, witch hat or devil horns (the last of which seem to be an option for every indian holiday), the rest was up to us. 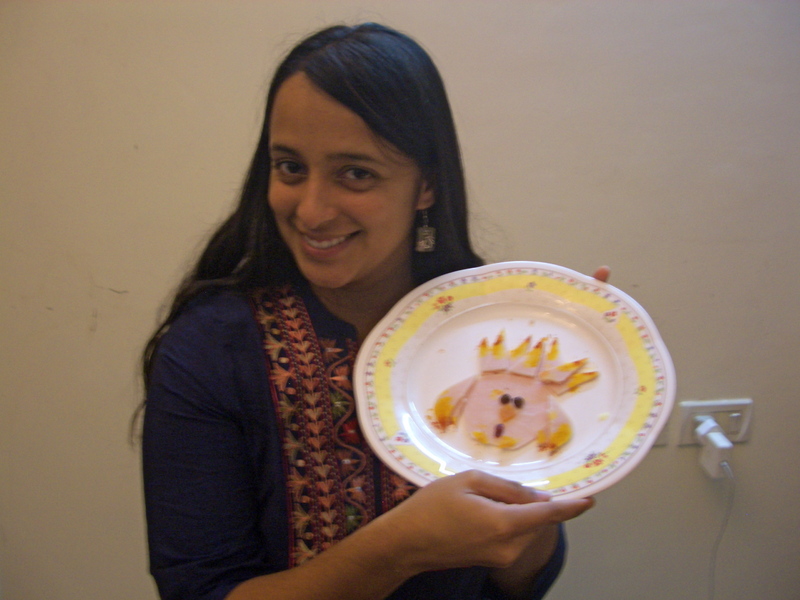 This is where we started to get creative: I managed to find a black kurti with orange chikkin work on it as my “costume” (to go with my light-up devil horns), and Devin found a black kurti for her “costume”. (in a culture with this much color, finding most color combinations is infinitely less difficult than finding anything that might look like it’s from the Gap). 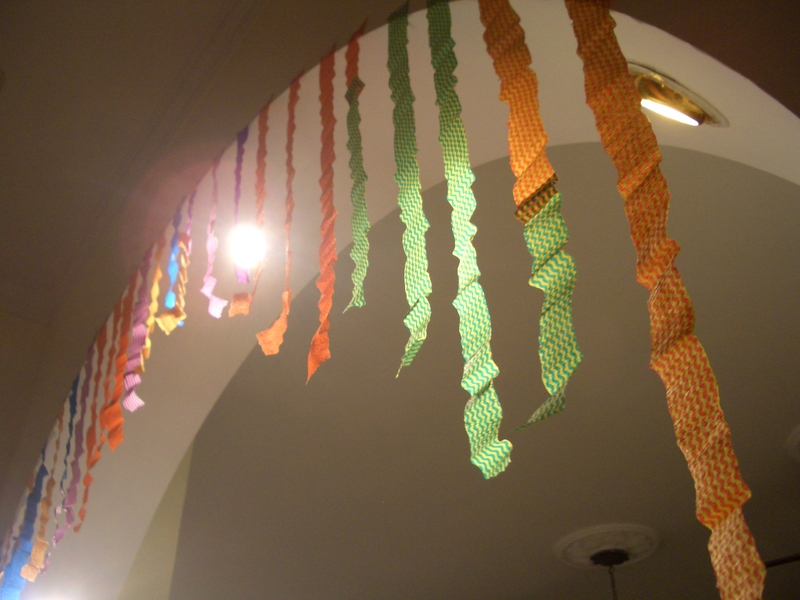 We couldn’t find black and orange streamers, so we hung some questionable streamers we found at a local party store from our archways (in a way that perhaps more closely resembled Cinco de Mayo). We used a dupatta and tea lights to make a spooky looking sculpture on our dining room table to set the mood as our guests entered, and even our statues of Lakshmi and Ganesha who were still lingering from Diwali got displayed. Our roommate Sana’s mother brought some candy corn from the US, and we interspersed that with indian snack mixes (Khatta Meeta, Kurkure, and our other Haldiram’s favorites) and we had a full Hindustani dinner cooked by our maid Anita (who looked on incredulously at the various decorations we kept bringing into the house that day). But this was my favorite part: a week before Halloween, while walking by one of the many green coconut carts that dot the streets in Delhi, I had thought, “I bet I can get them to carve the coconuts like jack-o-lanterns.” They had machetes. And they had time. All I had to do was explain to them what I needed. Me: Hello, sir. I have to ask you a special favor. Coconut guy: Yes, tell me. Me: So, in America we have this holiday where we carve eyes and a mouth into a pumpkin. It’s for our celebration. 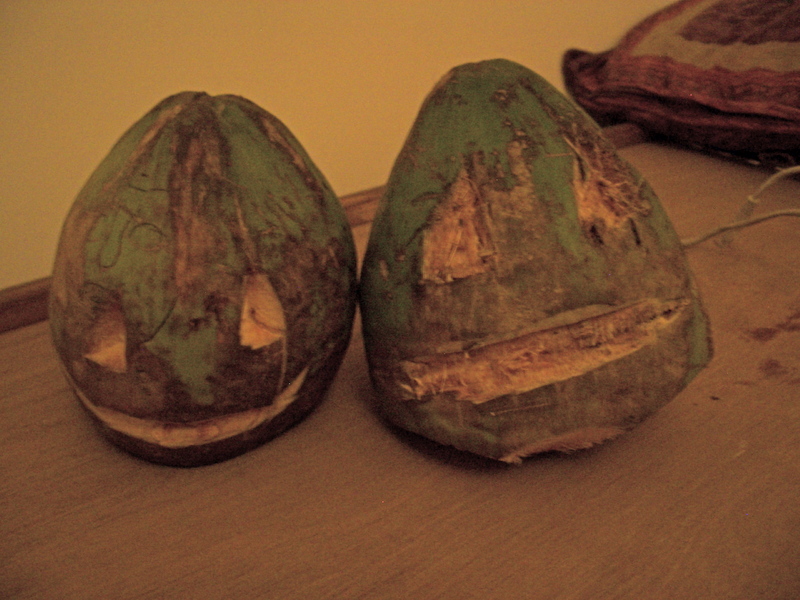 Are you able to carve two eyes and a mouth into this coconut? Coconut guy: (looking sheepishly/incredulously at his friends) Umm…? Me: Could you please just try? Anything will be fine. Just give it a try. Coconut Guy’s friends: Oh come on! The girl wants a face on the coconut. Just do what she’s telling you. He cut open one coconut, gave me a straw to drink the juice out of it, and then asked if I would purchase a smaller knife from the market, which I did. 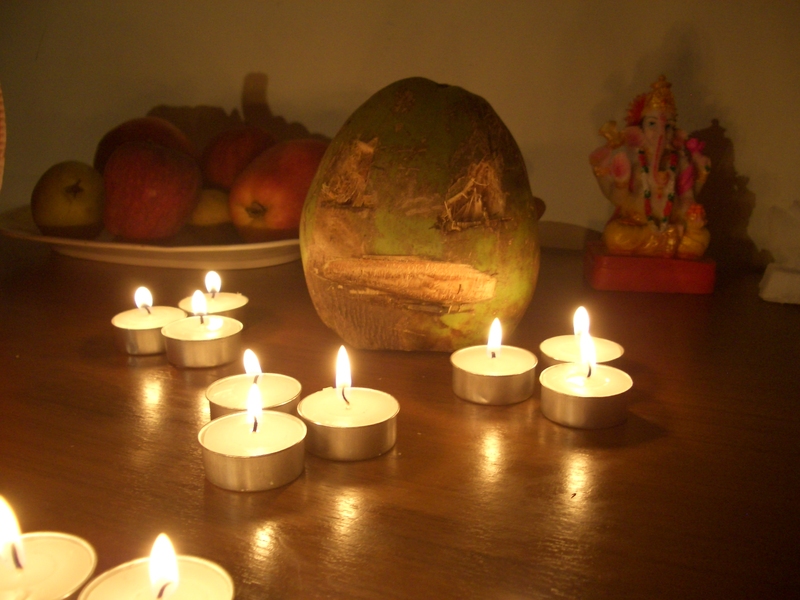 By the time I returned, he had already experimented with hacking the characteristic triangle eyes into one coconut. The surrounding coconut vendors were equal parts bewildered and interested in what was conspiring. They egged him on, one saying, “Hey, that’s not how you do it!” as he retorted, “Oh come on! Like YOU know how to carve eyes and a mouth into a coconut! !” I assured him that if he cut faces into coconuts and kept them on display on his cart, it would attract other americans, and he might get more business. He heartily agreed. 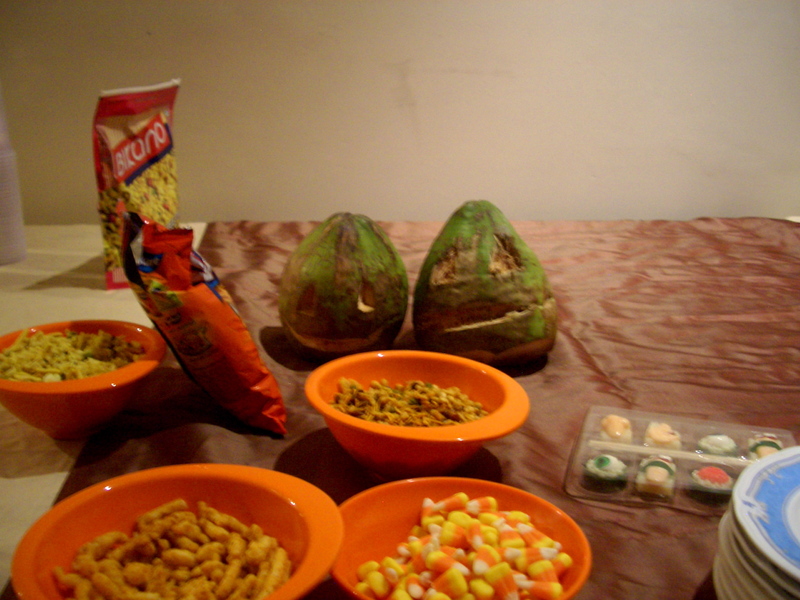 In the end, we had four lovely coconuts to display at our party. 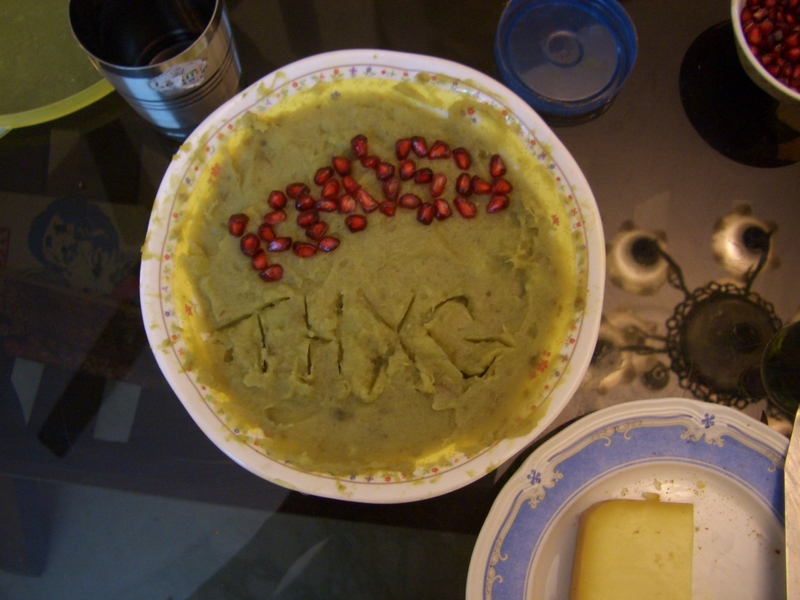 We had heard from numerous people that the American Embassy was notorious for a great thanksgiving spread, and we figure that as Fulbrighters, we could probably secure an invitation to the feast. It was not to be — the American Embassy in Delhi wasn’t hosting anything, and an American club that did have an event required membership to gain entry. We were out of luck. The main issue was the turkey. 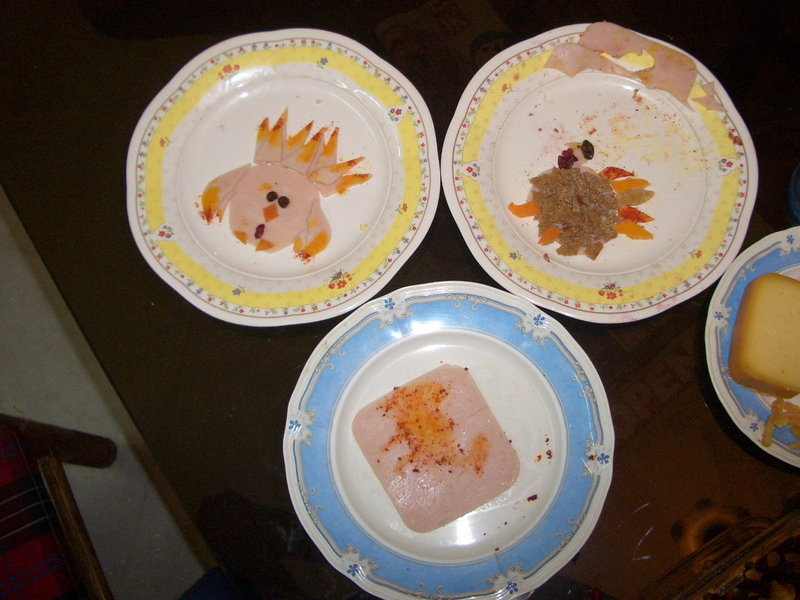 Ovens don’t come standard in apartments in Delhi, and a search for non-frozen turkeys left us high and dry. Devin and I went to Defence Colony to see what we could dig up, and sliced deli (delhi?) turkey was all we were able to find. 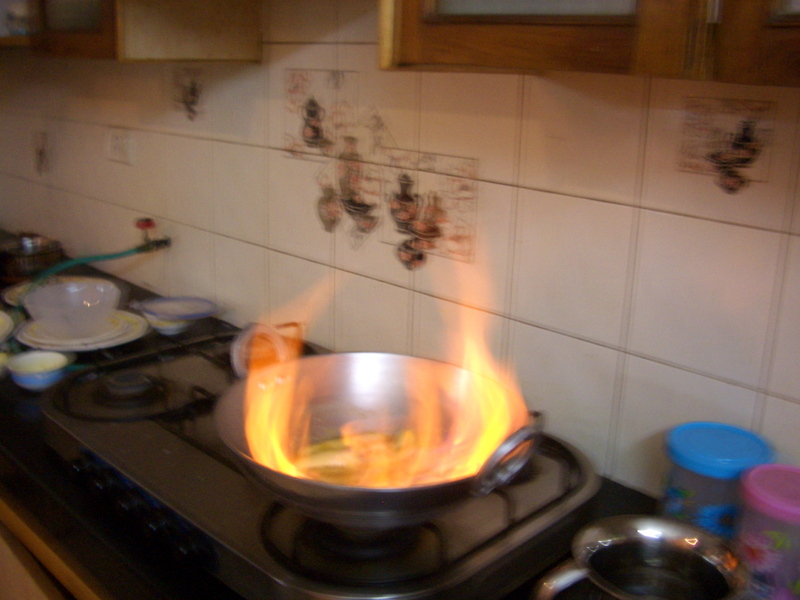 With some initially questionable but actually delicious yams, and a version of Bananas Foster that lived up to the bonfire we experienced in our landlords living room during Diwali, we had a pretty awesome Delhi Thanksgiving. inspired by the indian holidays we’ve celebrated so far, I’m now determined to find a reason to create a huge bonfire for every American holiday here. I’m enjoying the lack of fire codes while I can. 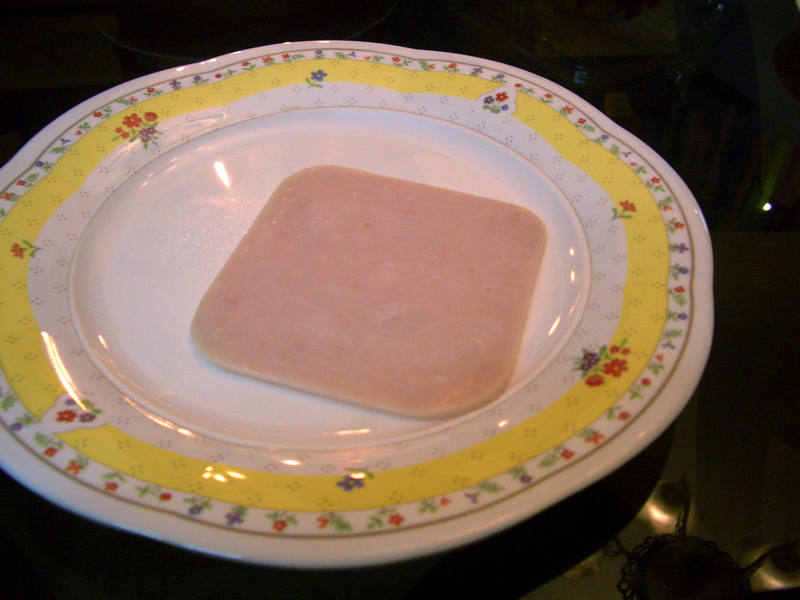 I am super excited about my “turkey”. As I’m a vegetarian, my roommates ended up eating it for me. So Christmas is around the corner. 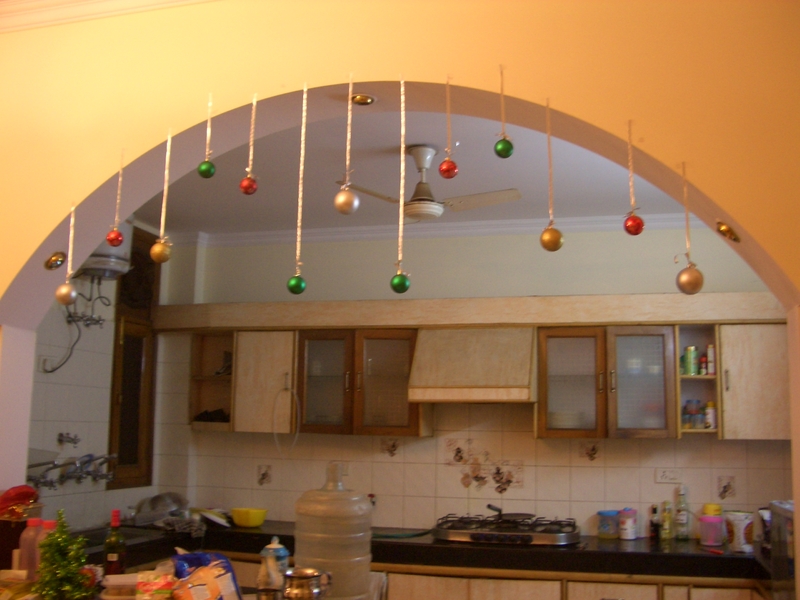 While the other two holidays are completely foreign in India, Christmas is at least a known entity to most people (including Anita, who is anxiously awaiting it. Although there was a point during the preparations for Halloween where we tried to describe candy canes to her: “You know how if you can’t walk, you get a stick to walk with? So for Christmas, we make little versions of those sticks out of sugar and they are red and white, and we hang them on a tree.”). This time, we realized right away that trying to get a full-sized evergreen for our picture window was a near impossibility, and alternatively decided to remove our Cinco de Mayo-like Halloween streamers and hang christmas ornaments in the arches over the kitchen and living room entrances instead. A little silver ribbon from the market and we were in business. However, Sana and I, realizing that while we did not have evergreens, we did have the advantage of a country full of amazing tailors, decided to embark on another Christmas adventure: getting personalized, Indianized christmas stockings for all five of the residents of The Laj. 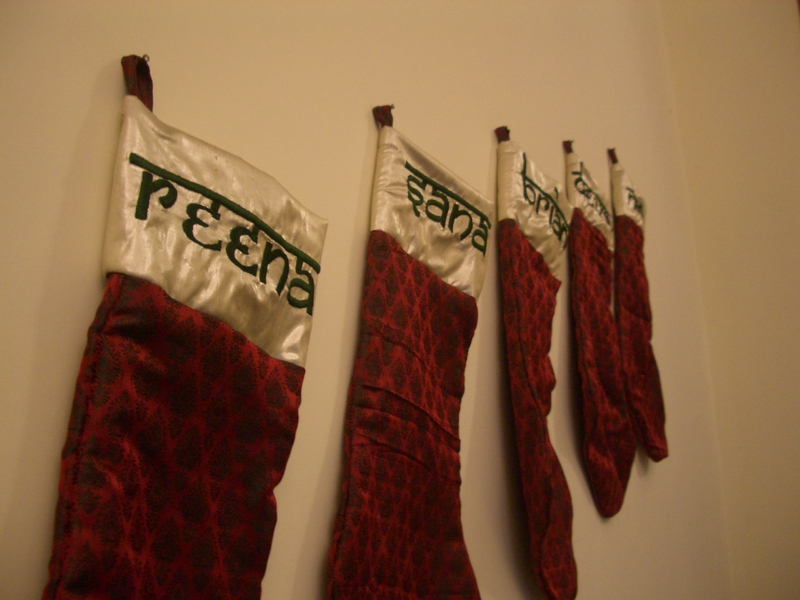 After making a rough stocking pattern, we downloaded that cool hindi-looking font and printed out everyone’s names in the appropriate size. Then we took everything to the market, and looked through a variety of fabric stores to find material that was both Indian and Christmas-y. We came up with a lovely red and green brocade with a characteristic Indian print, and we even found a fabric with a light gold sparkle for the cuff. We tried to find batting for the cuff (the stuffing-like fabric you put in between the back and front of a quilt to make it… quiltlike), but obviously no one knew what we were talking about, and the closest we could get was cashmere pant material which was at least thick enough to make the cuff stand up. Necessity is the mother of… christmas stockings. The fun part was when we got to the tailors. The first tailor (a man with a sewing machine sitting out on the street surrounded by scraps of colorful fabric) agreed to sew our stockings, but couldn’t understand why we wanted five enormous individual socks. At first he asked if we wanted a zipper on the back of the sock. Then he asked if we wanted a drawstring at the top to tie it. We tried to explain to him that we weren’t planning to wear the socks, but in America, we hang these socks over a fire to celebrate our holiday. Which he couldn’t get his head around. 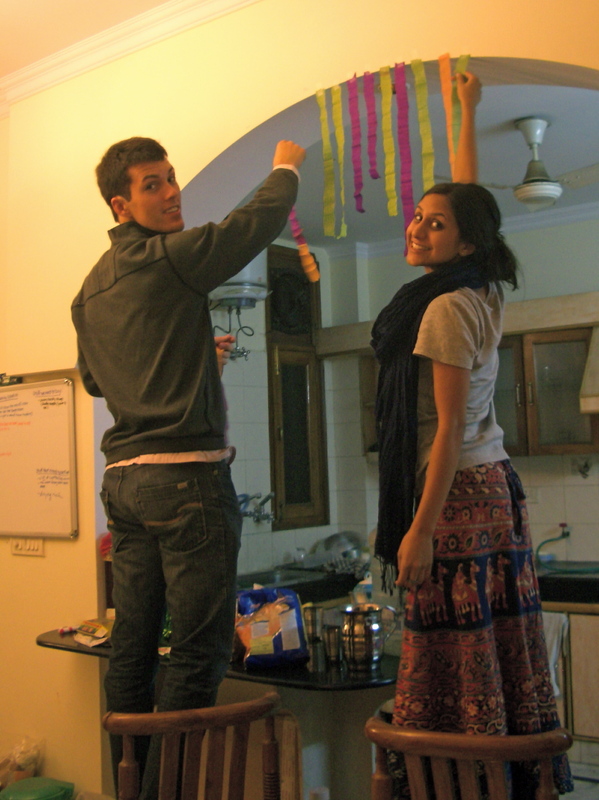 Then Sana told him that we were planning to hang the socks on a wall as a decoration. Again, blank stare. However, Sana and I were most worried about the embroidery — after inquiring about embroidery within some of the more fancy shops in the market and coming up empty handed, we were finally led through a back alley and up three flights of stairs to a few people with sewing machines on a rooftop above some earring stores in the market. Obviously, neither Sana nor I have a command of Hindi that spans into the intricacies of sewing techniques, so there was just a lot of gesturing and smiling. We left feeling apprehensive at best. But the tailor came through! We picked up our beautifully embroidered names, took all the fabric back to the first tailor, and got the stockings stitched. Voila! Christmas in The Laj! We still have a few ideas up our sleeve — a mini tree that our roommate’s girlfriend brought with her from the US will be decorated with earrings and ribbons from the market, and I’m sure there will be some cooking fun. This entry was posted in Uncategorized and tagged christmas in india, coconut jack-o-lantern, customs, halloween in india, holidays, indian christmas stocking, thanksgiving in india. Bookmark the permalink. This is so awesome. Reena, you rule! I can only second Amber. Amazing! And Hilarious. We do do some weird things in this country.